In the conclusion to My Bookstore: Writers Celebrate Their Favorite Places to Browse, Read, and Shop, Emily St. John Mandel says, “Things happen in independent bookstores that don’t happen in the other places where we buy books.” Perhaps that phenomenon is what inspired eighty-four authors to write essays about their most beloved bookstores. Edited by Ronald Rice, this collection offers odes, anecdotes, thank-you notes, and even a comic, all hailing different independents. Part salutation and part call to action, the pieces vary as widely as the stores they celebrate, but each one strives to prove that, yes, it does matter where one’s books are purchased. The modern world is defined by immediacy and impatience, while an independent bookstore embodies the opposite characteristics. As Ann Patchett says, “A very good bookstore feels a little nostalgic, a place out of time. Look at all those people looking at books! It is at once both rare and beautifully ordinary.” How wonderful to be given the chance to slow down and browse. Though the stores across the nation differ in size, arrangement, and whether or not they have a café or a feline-in-residence, they all encourage this sacred slowing-down. Of Changing Hands Bookstore in Tempe, Arizona, Ron Carlson says, “Stepping through the door changed the world; here was art, solace, a thousand hardback conversations.” These bookstores cast a spell that draws readers through their doors time and again, sometimes even across great distances, and that has as much to do with the stores themselves as the people who run them. Rick Bragg says, “Maybe the reason I say Alabama Booksmith is my favorite is because Jake Reiss gives me hope that my craft will endure.” These are tough times for writers and booksellers alike, and yet it’s clear from this collection that neither is throwing in the towel. Ian Frazier says, “Like a poet writing to make the rent, an independent bookstore exists at that heart-quickening juncture of love and need.” People who own and work in bookstores aren’t in it for the money. They sell books because they love them, and they want others to love them, too. Numerous authors note hand-selling as a key component of the independent’s modus operandi, and as Ann Haywood Leal says, “Finding a book in someone’s heart is a talent.” Essay after essay speaks of booksellers so familiar with their customers’ tastes that they stock titles with specific readers in mind. That kind of personal attention is something the superstores can never offer. Another quality unique to independent bookstores is the sense of community they cultivate. 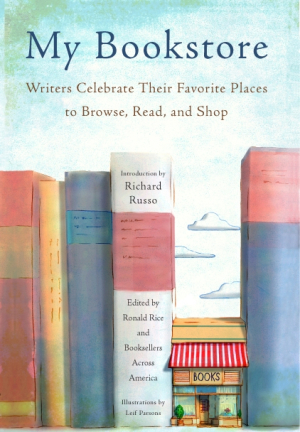 Richard Russo says, “Bookstores, like libraries, are the physical manifestation of the wide world’s longest, best, most thrilling conversation.” These authors speak of the town bookstore as a readers’ mecca, a gathering place for the like-minded to discuss the works of writers both from down the street and half a world away. As Jon Clinch says, “Folks here understood that books are things that you talk about. Things you need to talk about, because the more you talk about books, the more you understand the people you’re talking about books with. It’s as simple as that.” Several essays pay homage to bookstores that have been forced to close shop, and when this happens, the community mourns and, in some cases, revolts, working together to bring the store back to life. It’s clear that independent bookstores are about so much more than “just” books.